VeryDOC Flash to GIF Animation Converter has the capacity to convert flashes or flash to animated GIF, or SWF to GIF animation files. With the help of VeryDOC Flash to GIF Animation Converter, users can easily convert one flash to GIF animation file, or can batch convert multiple flashes to animation files. 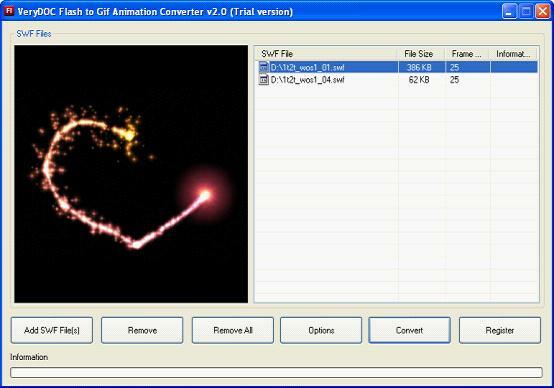 By method of VeryDOC Flash to GIF Animation Converter, users can change the height and width of the GIF frame. The height and width range from 1 pixel to 3000 pixels. When convert flashes or flash to GIF or SWF to GIF by means of VeryDOC Flash to GIF Animation Converter, users can customize the frame rate of GIF animation. The frame rate can range from 0.01 to 100 seconds.